Supporting the economic wealth of Illinois communities. 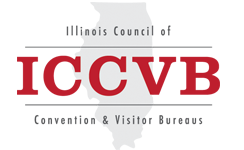 Working together with the Illinois Department of Commerce and Economic Opportunity, Office of Tourism, ICCVB enable members to be more effective and efficient in attracting visitors to their communities. The Council provides educational opportunities that raise the level of professionalism in the travel industry, and it provides a forum for networking and cooperative action between the members. The organization also maintains a proactive legislative and advocacy effort on issues that affect tourism and business travel in Illinois through its Advocacy and Legislative Affairs Committee. Mt. Vernon CVB will host ICCVB's Spring 2019 Membership Conference May 1-2. Select this link for details and registration. ICCVB is engaged! Select this link for more information on our advocacy efforts. Want to learn more about our members? Select this link. Our member bureaus are here to help you with your planning needs. From RFP support to local businesses and contractors to support your event, ICCVB members can provide you with the tools to plan successful events, tours, visits, etc. Please use the provided link to access information (bureau name, contact, e-mail, phone, etc.) on all of our members and see how a bureau can help you.